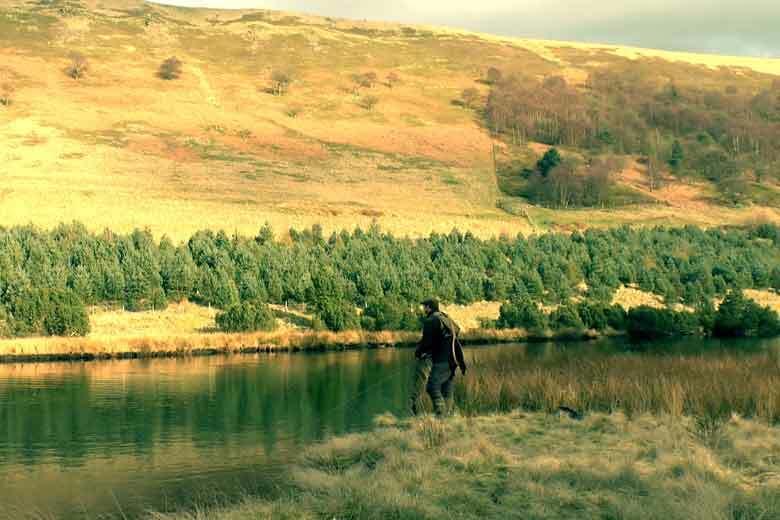 I learned my craft on fast flowing sections of rainfed Peak District rivers. Traditional upstream nymphing is in my blood and is probably my favorite method of fly fishing my home rivers. Being able to read the river, understand where the fish will be, cast your nymph in the right spot, detect the take and strike into the fish is exciting and skillful. I enjoy all forms of fly fishing but upstream nymphing, in particular, will always be slightly more enjoyable for me. 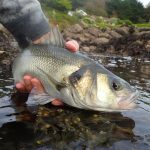 Many established anglers would argue that fishing dries upstream requires the highest level of skill but I would disagree, after all when fishing dries an angler can not only see exactly where the fish are but also what they are feeding on. These are two elements which are a mystery to the prospector, who must full in these blanks using knowledge and skill! What is upstream nymphing & prospecting? 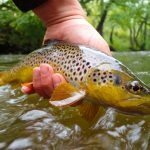 From my experience in coaching fly fishing to both novice and more established anglers, upstream nymphing seems to many to be a dark art. Something mysterious and misunderstood. I believe this is because of a trap many new anglers fall into which is to start their river fly fishing careers by fishing slow sections of river for rising fish. This is completely forgivable, anglers are merely following logic. 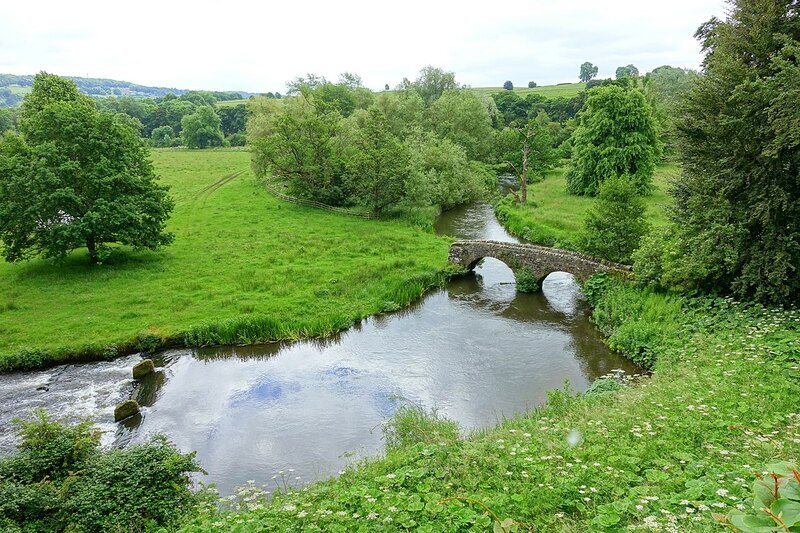 They arrive at the river and seeing fish rising in the slow pools, try their best to observe what the fish are taking, match a dry fly to the hatch as best they can and cast it to the rising fish. This is all good stuff. Many new anglers will struggle to catch in these situations. This is because they have probably chosen some of the hardest fish to catch for a beginner. 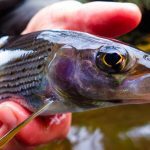 In slow-moving pools fish have all the time in the world to examine your fly as well as those little imperfections such as your knot, the crease, and kinks of the leader in the surface film, the floatant dispersing into the water. Additionally, every little splash and indiscretion in your casting ripples through the pool as well as all the waves from your wading which move through the water like a Tsunami. Those rising fish are so tempting and not knowing any different a new angler keeps going back to them again and again, often with the same results. Many new anglers also walk through all those fast rifles and glides without so much as casting a second look at them never mind a fly. As you will find out later in this article, it’s those bits of water that contain the key to your success! A nymph in nature is the part of the lifecycle of an aquatic fly. A nymph lives in the water, exactly where it lives depends on the species of fly. Some nymphs cling to the bottom of stones, others bury themselves into the stream bed. 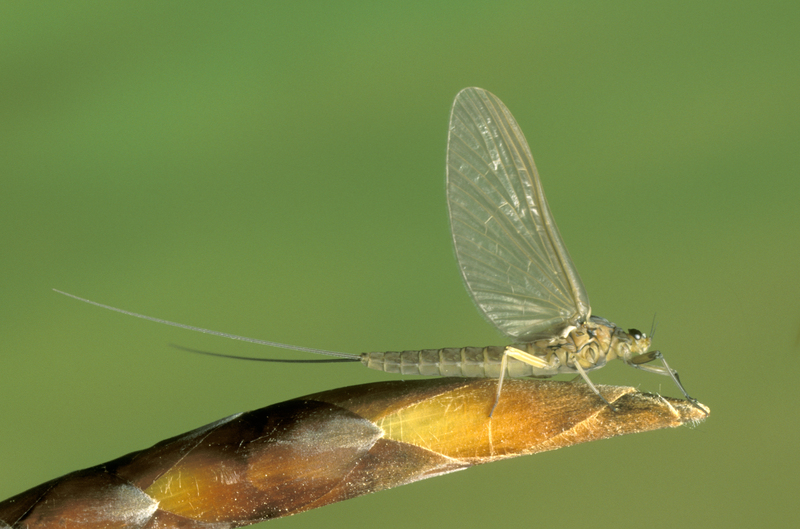 At some point in the year (when depends on species) these nymphs ascend to the surface and hatch out as an adult fly. 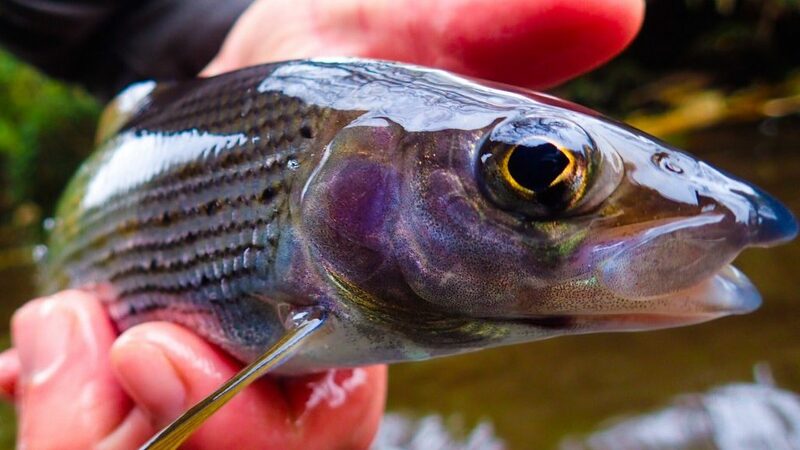 Trout and Grayling feed heavily on nymphs either as they tumble down the stream after being dislodged or, when they ascend to the surface to hatch into flies. Upstream nymphing involves casting an imitation of a nymph upstream and then allowing the fly to tumble back down the stream towards the angler. On visually detecting the take by observing the movement of the fly line the angler strikes to set the hook into the fish. There are two types of nymph fishing – sight fishing and prospecting. To sight fish is to observe a fish feeding on nymphs and deliver an artificial nymph to that particular fish. This is common when nymph fishing on clear chalk streams where visibility is good. On the fast running streams of the North, however, observing fish feeding on nymphs is difficult if not impossible even with the best polarised glasses. 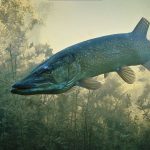 In these situations, an angler needs to observe the flows of current, bubble streams, riffles, rocks and pools and predict where the fish will be lying. 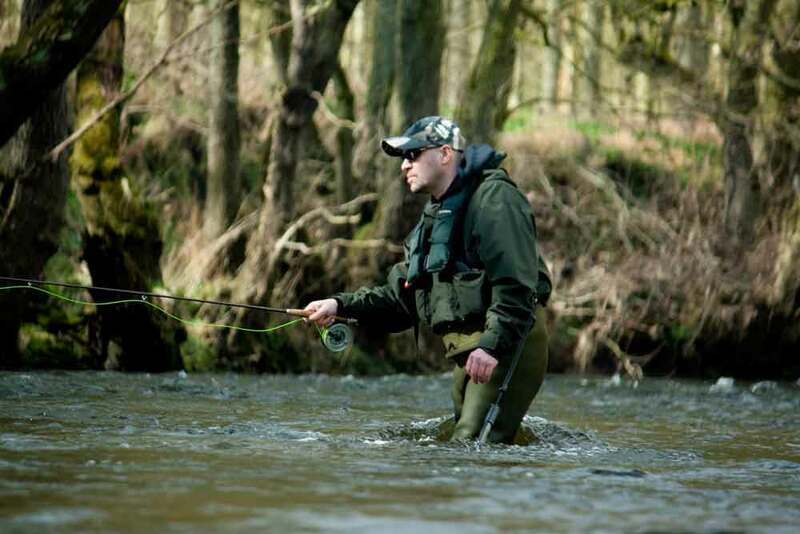 The angler then needs to cast the nymph in such a way so it runs through these places in the correct direction and depth to tempt the fish, this is commonly referred to as prospecting. As we have already learned, a nymph is a specific stage of the lifecycle of an aquatic fly. In fly fishing, we do however imitate all sorts of bugs, creatures & larvae. For simplicity, most fly anglers will still call the method “upstream nymphing” even if they are casting a fly that imitates a small shrimp or larvae. The term “upstream nymphing” is more a reference to the method as opposed to the fly. 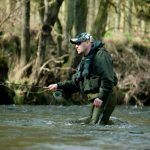 All anglers have a preference as to their rod but there are a couple of key factors in choosing a nymphing outfit. Firstly, you will be casting an awful lot so something light is essential. Luckily, most modern tackle is fairly light – even budget rods. Something in a #4 weight is ideal. 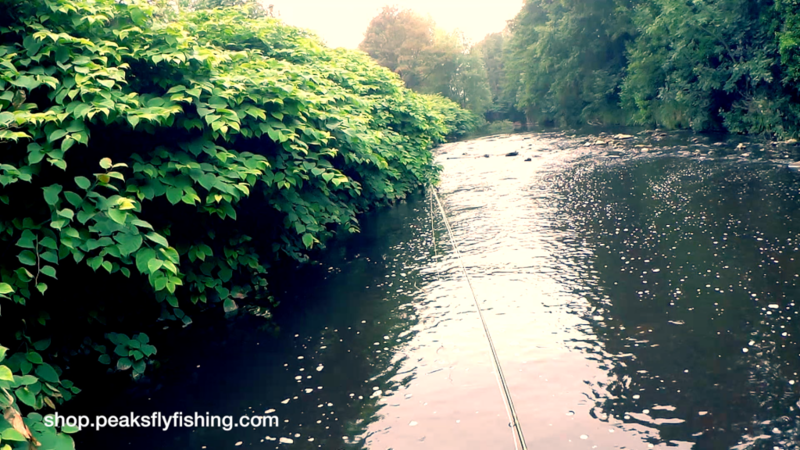 In terms of rod length, you should go for a 9-foot rod if you are not constrained by trees. If movement is limited, then choose a shorter rod. The action of the rod is important. 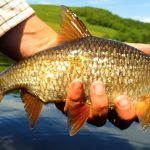 You need something with a soft enough action to play hard fighting fish at close range without bumping them off when they shake their heads. Avoid fast or tip actioned rods. A mid-tip action or even something a little softer (if you can get on with it) is ideal. A standard weight forward floating line that matches your rod is all that is required in most circumstances. 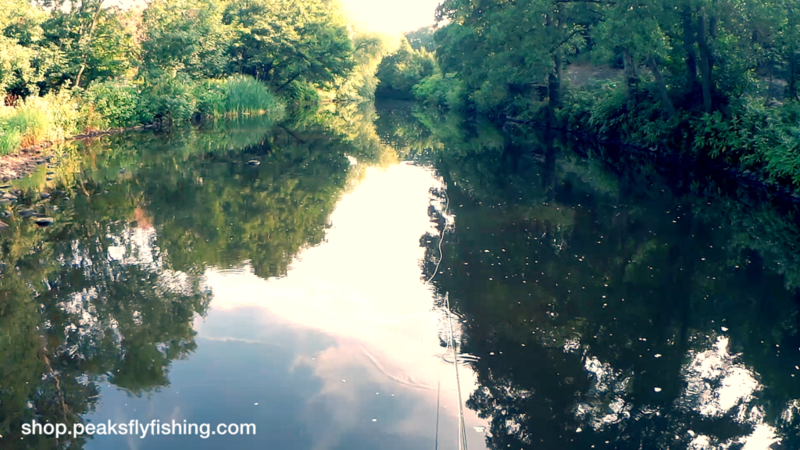 Much of your upstream nymphing will be in quicker water so you are likely to be fishing at fairly close quarters to enable you to keep control of the line, if you fish a very short line then you may not feel the rod is loading enough when you cast, you could experiment in these circumstances by overloading the rod by 1 line weight (ie. using a #5 weight line on a #4 weight rod) to compensate for the shorter line. I’m not a big fan of either double taper lines or “delicate presentation” lines but that’s just my personal view and I know that many other anglers enjoy fishing with them. 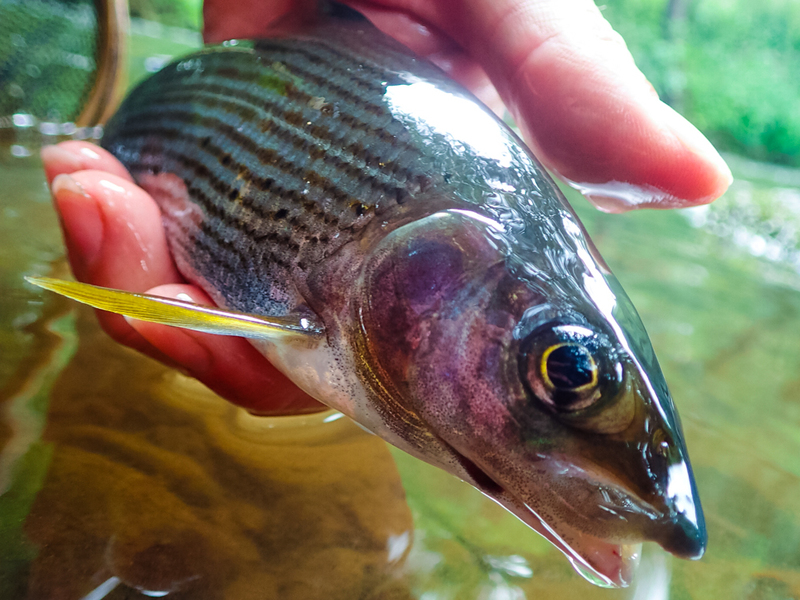 As with much river fly fishing for Trout and Grayling, the reel isn’t crucial to the setup. 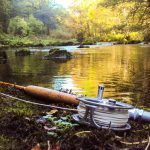 Get a dedicated river type reel that’s and small and suitable for the line weights you will be using. 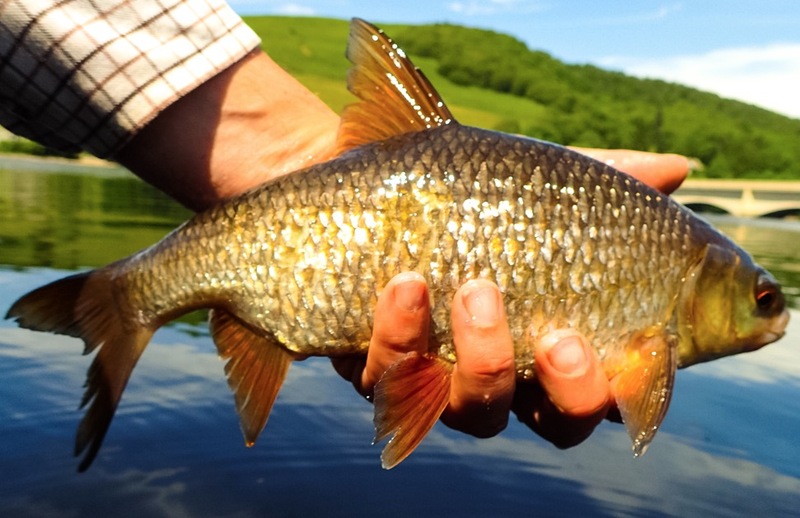 Spend as much or as little as you like, it’s not going to catch you any more fish! A good pair of polarised sunglasses will help remove the surface glare. This may help see fish near the stream bead taking nymphs. Also it will help you observe “the take” allowing you to react and strike in good time. It’s also essential for eye protection when fishing. This will be your “strike indicator”. Everyone has their favorite colour, I like the hi-viz green variety. Apply the grease to the braided loop and the last few feet of the fly line. This will help it sit up high in the water so it’s visible. Keep reapplying as required during your session so you see every take no matter how subtle! Whilst we want the fly line and braided loop to float, we want the leader to sink. Apply this degreaser to the length of the leader with wet fingers to remove any oils and grease and help it cut through the surface film. I don’t bother with tapered leaders for upstream nymphing, my casting is good enough to turn over the fly and the weight of the nymph will turn the leader over crisply. This is just my personal preference and if you prefer to fish using a tapered leader then go for it! I prefer using Fluorocarbon for my nymphing fishing as it’s slightly more resistant to abrasion from the rocks and tends to sink a little better. Again, this is my personal preference and if you want to use Mono that’s fine. This is the important bit. You need to consider two things when choosing your nymphs. You will need a few different weights of fly as most of your upstream nymphing will be targeting fish around the bottom of the stream bed. 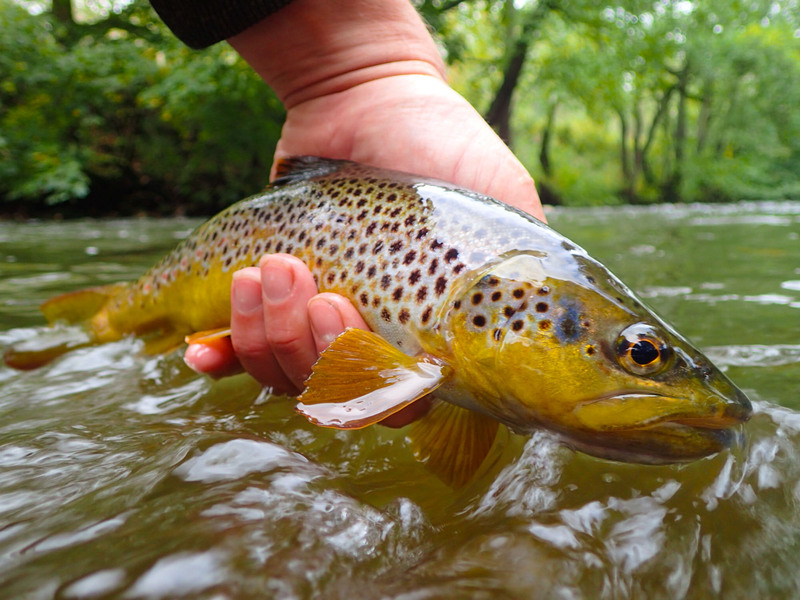 As stream depth varies throughout the river, so your nymph weight will also need to vary. 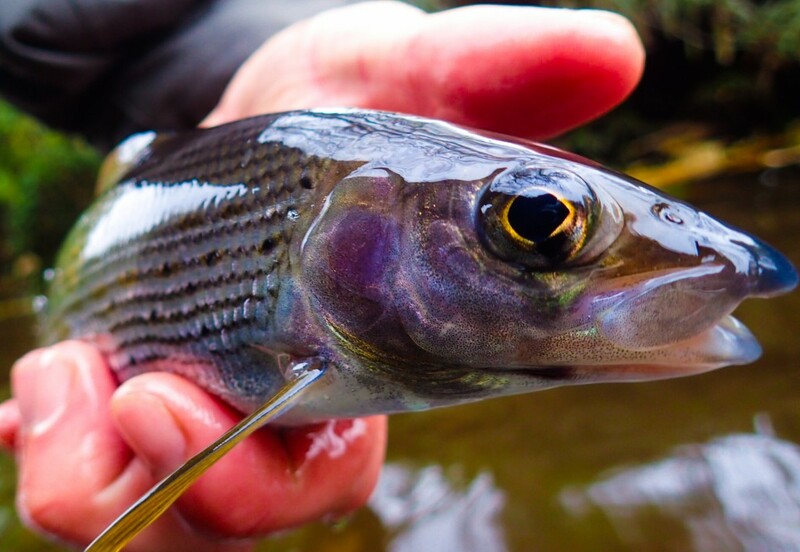 You need to fish with nymphs that imitate the nymphs that the Trout & Grayling feed on in your stream. In reality, this is reasonably easy as there are a few patterns that should cover the likely flies. I would argue that the depth of your fly and the direction of travel in the stream is as (if not more) important than the pattern you use. The flies listed below are tried and tested and will catch fish all over the UK. Watercraft & Where To Fish. 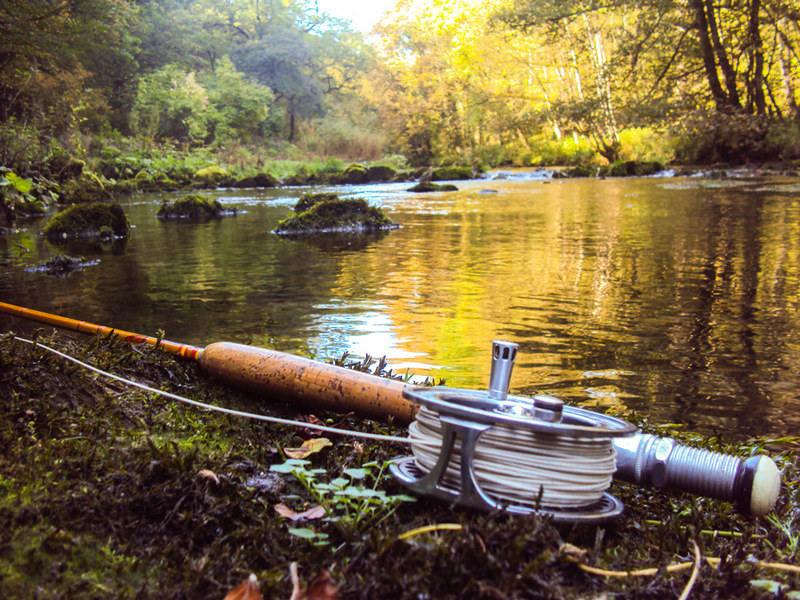 To fish a nymph in a dead drift (so it tumbles downstream at the same pace as the current) requires some flow in the water. Ideal nymphing water has enough flow so the nymph will travel back down the river towards the angler and be ready to be recast before it snags on the bottom. That said, it’s important under normal circumstances that every so often your nymph does touch the bottom – this shows that it’s getting down to the feeding zone around the stream bed. It is possible to fish a nymph in slow water (see active nymphing below) however this water may be more suited to dry fly fishing. Another option in very slow water would be to use an indicator to support the nymph so it fishes at a fixed depth. Classic bubble stream the concentration of white bubbles indicates a concentration of current and food. Bubble streams are areas of concentrated current where the bubbles on the surface of the water are concentrated into a line on the surface of the river. These are always good fish holding areas as a concentration of current also means a concentration of food moving down the stream. Fish will often sit in or around bubble streams feeding on nymphs and other food items as they tumble down the bubble stream. A riffle is a fast turbulent area of water, normally located at the head of a deeper pool. Riffles are excellent nymphing areas. Fish will sit in the riffle at the head of the riffles to get first dibs on food entering the pool. Fish also tend to be confident feeders in riffles as they are well-hidden from predators by the turbulent water. You can’t see the fish in the riffles which also means they can’t see you, this gives the angler a distinct advantage. 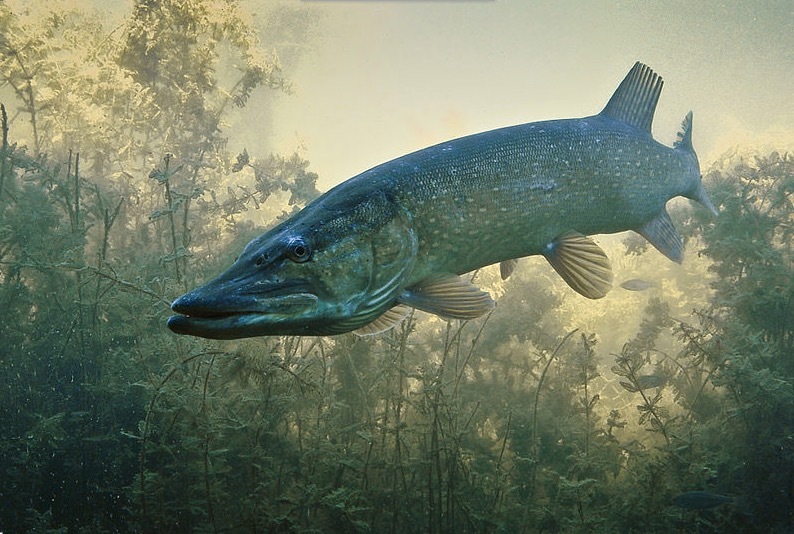 Rocks provide refuge from the current and are excellent fish holding areas. Fish will often sit in front of a rock where the current pressure is reduced by water bouncing back off the rock. The will also sit slightly back and off to one side of a rock in the “V” of current, this is a good lie for picking up food as it runs down the stream. Immediately behind a rock looks like it’s a good spot, however, the water can have a washing machine effect here meaning the fish doesn’t have a predicatable line of current to feed in, this is why the fish will often sit slightly to the side in the “V” where the current line is more predictable. A classic glide. Note the wide distribution of white bubbles which means an even flow of current in the stream. A glide is a smooth but fairly quick area of water, it often has a reasonable depth to it and makes excellent nymphing water. Glides often have some depth to them so a heavier nymph may be required. 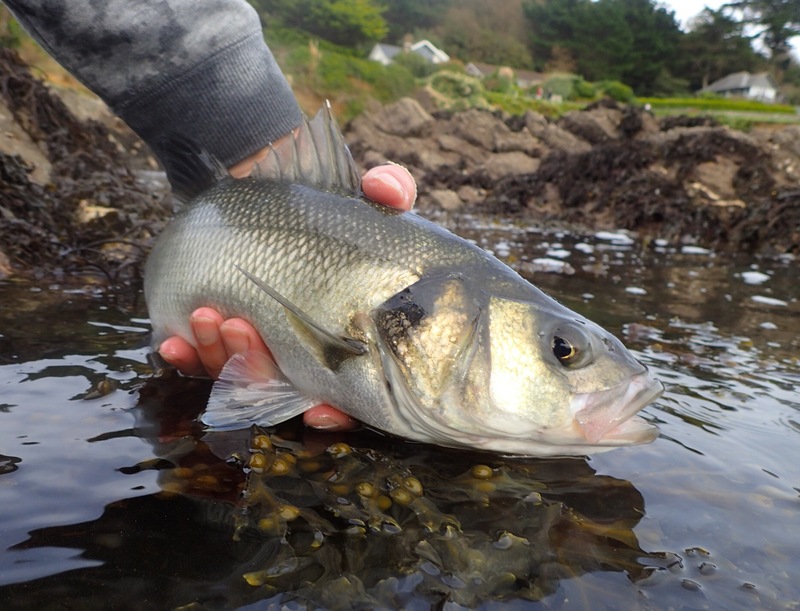 On the whole, very slow water isn’t suited to nymphing as the nymph is unable to move through the water with the current to allow the fish to intercept it. In slow water, it will often just sink to the stream bed. 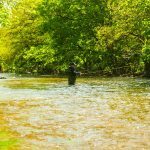 This is why slow pools are more suited to dry fly fishing. 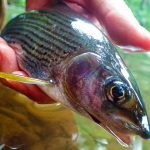 There will be circumstances when nymph fishing is still required particularly when targeting Grayling that are not rising to dries. In these circumstances, you could either use an indicator to fix to the depth of the nymph so it doesn’t hit the bottom. 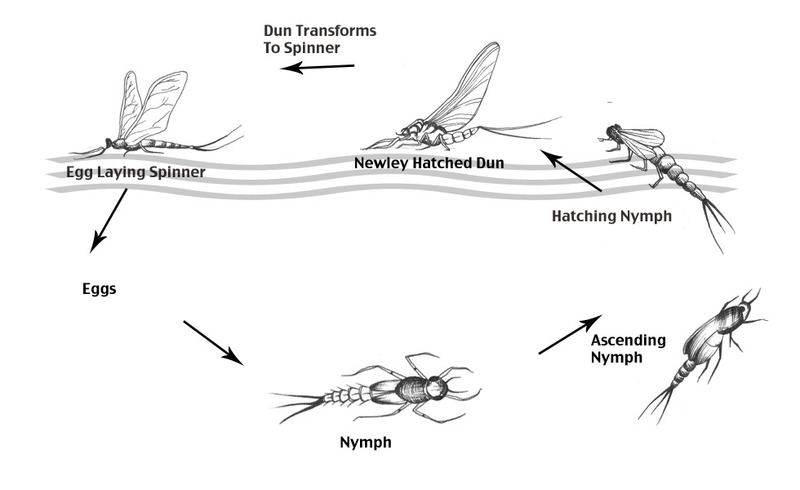 Another option is to give the nymph some movement in the form of a retrieve to keep it off the stream bed. This can be very effective, you can treat the slower pool as a stillwater. You will however often need to get the fly deep down to the stream bed and this will take some experimenting to find the correct retrieve to do this. Takes will often be more subtle here, you need to keep in touch with the fly and strike at the smallest of movements in the braided loop. Coping With Varied Stream Depth. Fly anglers are often habitually lazy! 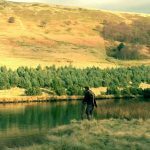 As you wade uptream fishing, you will encounter varied stream depth from the shallow fast riffles to deeper pools and glides. It’s really important that you carry a variety of nymphs that can cope with the varied stream depth and more importantly use them! Keep changing your nymphs to suit the water infront of you. It only takes a few seconds to change a nymph and can be the difference bewtween blanking and catching. Your nymph should be catching the bottom from time to time, this shows it’s getting down to the feeding zone. If it’s not getting down then change to something heavier! 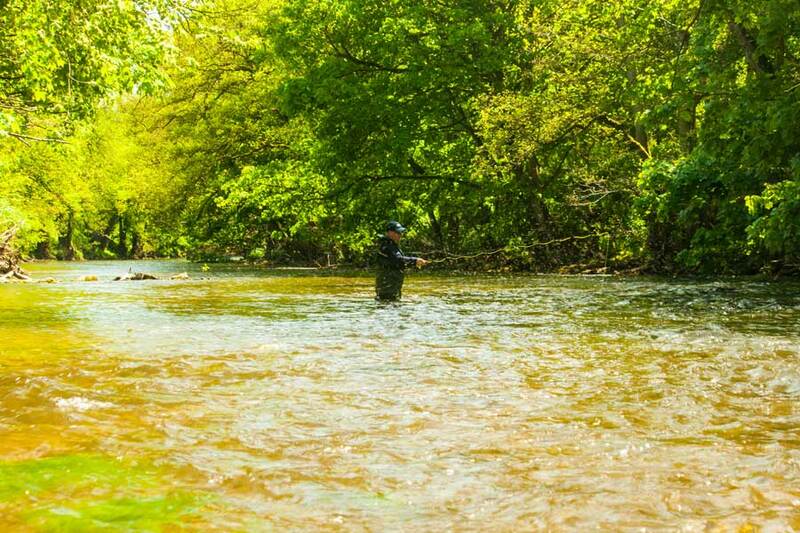 Upstream nymphing requires a tight, accurate cast and good line management. Using false casts, work out the required length of line and then deliver to the water. 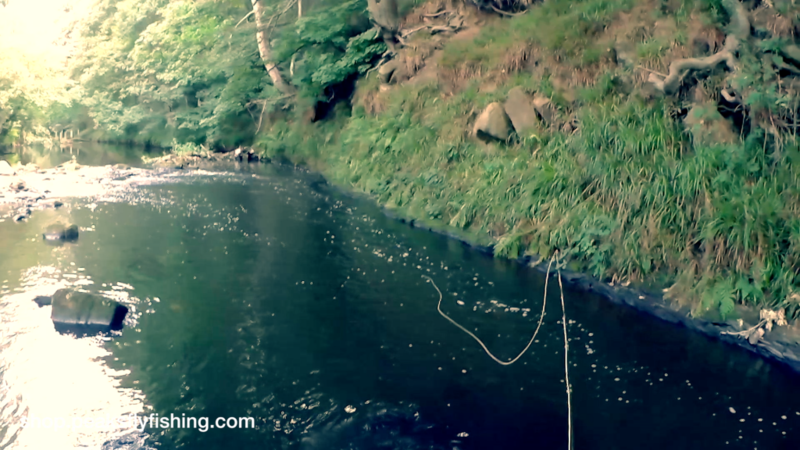 As the line travels back down the stream towards you pick the slack line off the water using your line hand. At the same time as retrieving the line, you may find it useful to slowly raise the rod tip, this will help pick off slack line developing on the water near the tip of the rod. It important to cast upstream when nymph fishing, Trout may not be clever creatures but show a keen instinct for what is food. They are expecting their food to come down at the pace and direction for travel of the current, an upstream presentation is by far the best way to do this. This is a balancing act, you need to retrieve to pick up the slack but leave a tiny bit of slack in the line so the nymph still runs down the stream in a dead drift. If you retrieve the line too quickly you will start to pull the fly and this will mean it rises up in the water. At the same time as the nymph and line are coming back down the stream towards you, you need to keep an eye on your braided loop. In normal circumstances, your braided loop will travel back down the river at the pace of the current. If however, your braided loop stops or slows down it indicates that something has obstructed your nymph. It could be a rock, weed, or a fish. You must react very quickly with a firm strike to set the hook. How fast will a nymph sink? Judging where your nymph is in the water column is vital to success when nymph fishing. In most circumstances when you are prospecting with a nymph, you will want to be just off the bottom. How deep your nymph sinks will be determined by the length of your leader, the weight and profile of your nymph and speed of the current. Make sure you are occasionally touching the bottom with your fly, this way you know you are deep enough. If you are not occasionally touching the bottom you are not fishing deep enough!